IT HAS been a long time coming. After 52 years of fighting, almost four years of peace negotiations and three months after a final deadline, the Colombian state and the Marxist guerrillas of the so-called Revolutionary Armed Forces of Colombia (FARC) have agreed to a bilateral and “definitive” ceasefire. That is cause for celebration, for Colombia and for the region. But the peace deal is controversial. 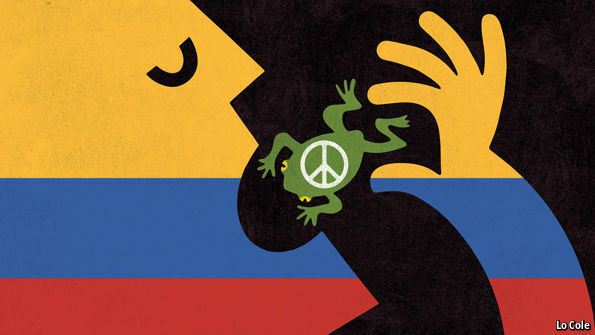 Putting it into practice will be tricky and it may be made harder by the unpopularity of the government of Juan Manuel Santos, Colombia’s president.